Softcover - 528 pages. Publisher - Thomson Schirmer. ISBN: 0534251870. Dimensions: 7" x 10"
The Basics: Preparing Scores and Parts. 1. 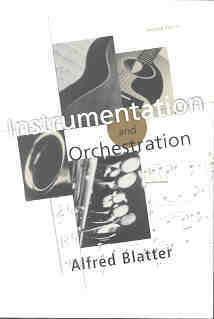 Instrumentation: The Orchestral Strings. 7. Orchestration: Scoring Musical Elements. 8. Orchestration: Scoring for Various Ensembles. 9. Orchestration: Techniques of Transcribing. 10. Orchestration: Techniques of Arranging. Our price: $69.95 + $10 shipping for first item, others $6 each.